Thank you for your most wonderful and kind support. This Christmas season we raised over $10,000 from your donations. This is quite amazing and incredibly helpful. We will use your donations to provide our children with food, clothing, medical care, transport to hospital, Braille materials, Braille teacher support, our childcare program and our traditional arts training program. I have been at our school this January and would like to let you know how everyone is doing, most especially our children. As you may remember, almost all of our children in residence have suffered severe trauma. We have two sisters, the older of whom after their mother died was sold into slavery by their father and was neglected and physically abused by her "owners". Her younger sister has severe epilepsy requiring monthly treatment 137km away in the capital Phnom Penh. One child of ours lost her eye because her uncle hit her accross the face with a bamboo stick. Her parents disappeared into Thailand years ago when she was a baby and there has been no word from them since. Another little boy whose father disappeared while his mother was pregnant, nursed his dying mother until her death. Five children of ours all sisters with their little brother were abandoned by their abusive mother and their father who is a gambler put them in an orphanage where they were abused and neglected for years. Our blind children have also endured verbal abuse and isolation due to the profound ignorance of villagers and family members in their communities. Having these children in our care, means that we also know their villages and rural districts in Kampot Province. Many people, too many, are dying from preventable diseases because of poverty and lack of expert medical care. None have clean drinking water and malnutrtion takes it's toll, with a high rate of tuberculosis causing death or lasting health problems post-treatment. For two years some of our children were really quite (understandably) disturbed, suffering from post-traumatic stress, nightmares, anxiety, psychosis, behavioural problems, bed-wetting and so on. It is only now that a feeling of peace and stability has been found and real healing has begun. I cannot thank my staff enough for their dedication, patience and love. 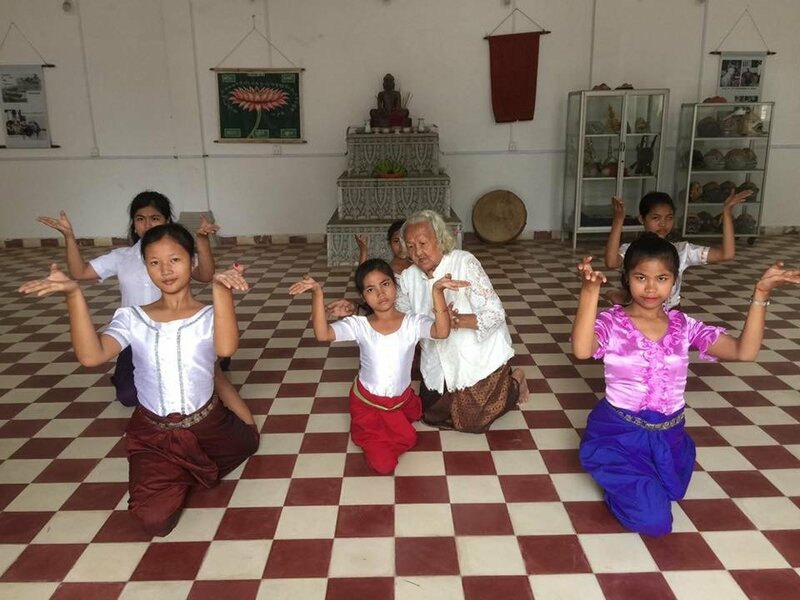 One example is our classical dance teacher Madame Kim An who comes from Phnom Penh to teach Cambodian ballet. She is originally a dancer from the Royal Ballet and her knowledge and skill are renown. She of her own volition and love of our children takes complete care of our adolescent girls. She understood that they were quite wild and stood in danger of going down the wrong path and getting lost in life, because they had never had a mother figure to guide them in early childhood. Although we have other staff, it is at this moment that our adolescent girls need Madame An, with her kind, sensible firmness and good education and use of language. They have flourished under her guidance and are doing very well. Our little children are also doing much better. I spent a lot of time with them listening to their accounts of their early childhood and working with them to find relief and let go of fear and pain. This is a continual process, but I have found that they are happier and more serene than before. I have shared my findings with our staff and will now work on other ways for us to give assistance and comfort to our children. In particular I will be assisting our folk dance teacher Mrs Vy Lyda to learn how to give childcare for their specific needs. In Cambodian culture there is no interpretation or specific words for psychological-emotional issues and so this is new territory. Mrs Lyda is a former student at our school whilst I was director there. She is now an adult, married with a young child and has founded her own dance and music troupe! As she grew up at our school, she has a closer understanding of the meaning of therapy and how trauma can affect behaviour. In order to help all our children on the path of healing, we have decided not to take in any more new resident children for the moment. We need to keep the equilibrium our children have found, until they are sufficiently strengthened to cope with the challenges of a new child or children coming to our school. However we have not forgotten the needs of those children who live in and near Kampot town who are desperately poor and in danger. I met with the head of the Department of Social Affairs to organise the assistance of several children who have no father and whose mother uses them for begging. They do not go to school because they are too poor. Our new project will include facilitating state school education, providing them with clothing and school uniforms, giving them meals and of course tuition in traditional Cambodian arts and then providing them with transport so that they may return to their mothers' in the evening. Our school together with the Deparment of Social Affairs will make an agreement with their mothers requesting that these children will not ever more be used for begging or other such activites. Our Outreach program continues to expand. We have several children from local schools who attend traditional dance lessons and Mohori music lessons. We have a group of girls from the Lyceum who study Mohori music with Master Samouen. Additionally we have several youth with disabilities who come and study traditional singing. 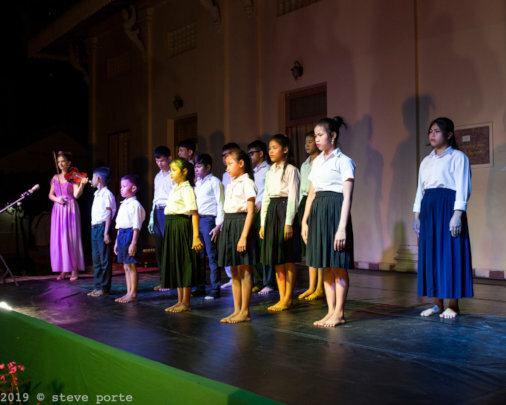 Last month as part of the Kampot Arts Festival which we did in partnership with Epic Arts and which we hosted, we gave dance, music and shadow puppet making lessons to over two hundred school children. The organisation SVA also brought their mobile library. Kampot town is currently in a bizarre situation which is difficult to know where it will lead. Thousands of expatriates have decided that this little town is ideal for their new home. Although there are some responsible and well behaved expatriates, unfortunately too many have alcohol and drug problems, as well as behavioural issues, whilst others are just culturally insensitive. The sheer numbers of foreigners (over seven thousand and counting) has created economic problems for the local population, pushing the price of goods, food, housing and so on to levels which are unreachable and untenable for ordinary Cambodians. There is now no longer any bar or restaurant along the river front that is Cambodian. Investors want to buy swathes of land towards Kep by the sea and turn it into luxury resorts. This would alienate local Cambodian people even more, so that it would become a Kampot within a Kampot. Following on from this, we are involved in meetings with the local Ministry of Tourism and other concerned agencies to find a way forward so that Kampot can have more measured levels of tourism, protecting the environment and making sure that Cambodian people are not pushed out of their own lands. Very seriously the large number of foreigners of whom their past is unknown has raised concern. Local authorities know that there are foreign phedophiles and criminals in Kampot and they are very worried. Our own staff are very gentle people and have had to learn very quickly that even foreigners wanting to "help" must not have any contact with our children and that we do not allow any volunteers at all. We have come accross some very unbalanced individuals and we have put into action several protective measures to protect our children and our school. In January I held over the course of two evenings special Child Protection Workshops for our staff, based on International Child Safety Guidelines. This involved discussions on stranger danger, reinforced protection policies for our school, a deeper understanding of the UN Covenant on Children's Rights and the recapitulation of our own Child Protection Policy. We also covered childcare and hygiene standards for our school. Additionally I met with local authorities to discuss concerns about child protection not just for our own children, but for all children in Kampot. I have also started coordinating with M'lop Tapeng from neighbouring Sihanoukville Province, who are experts on child protection. We are now organising extra workshops not only for our staff but also for police, school teachers, social workers in Kampot on child safety and identifying suspicious activity. We are also now in contact with APLE (and local police) in the eventuality of emergency intervention to save a child in danger and to request an arrest if necessary. Our school has been very busy recently. The Kampot Arts Festival which lasted three days was hosted at our school including the opening and closing ceremonies. Her Excellency the Minister of Culture Phourng Sackona came on an official visit and was very pleased and supportive with our work. Additionally Uon Sambo our Pin Peat master and myself gave an interview in Khmer language for VDP radio in Phnom Penh about our school. We also visited the University of Fine Arts (near the Royal Palace) in Phnom Penh to reinforce our communication and friendship with the University and Cambodian music professors there. As Kampot is far away, it's quite important to keep contact, as our own arts professors come from the University of Fine Arts or the National Theatre. We also collected new shadow puppet making tools from the puppet masters Sovannah Phum. We began our documentary film project to show how the ancient art of shadow puppets still continues. The film maker Ian Wiggins and sound recorder Rob O'Hara are very kindly and generously assisting us with this project free of charge. We are doing a project to raise funds to repair our main hall roof, as storm damage blew off roof tiles and there is leakage. This micro-project on Globalgiving has now closed but anyone wanting to help us can give on our main project link. Very sadly the wife of our director passed away last week and so we are all in mourning. We loved her very much and we miss her a great deal. Our hearts go out to our dear director Mr Sothy and his wife's family for their loss. On a happier note the first photograph of our report is of two of our girls who have just given a bath to their beloved cats. Our children really love their animals and this photo captures beautifully the joy and the laughter that reverberates round our school. 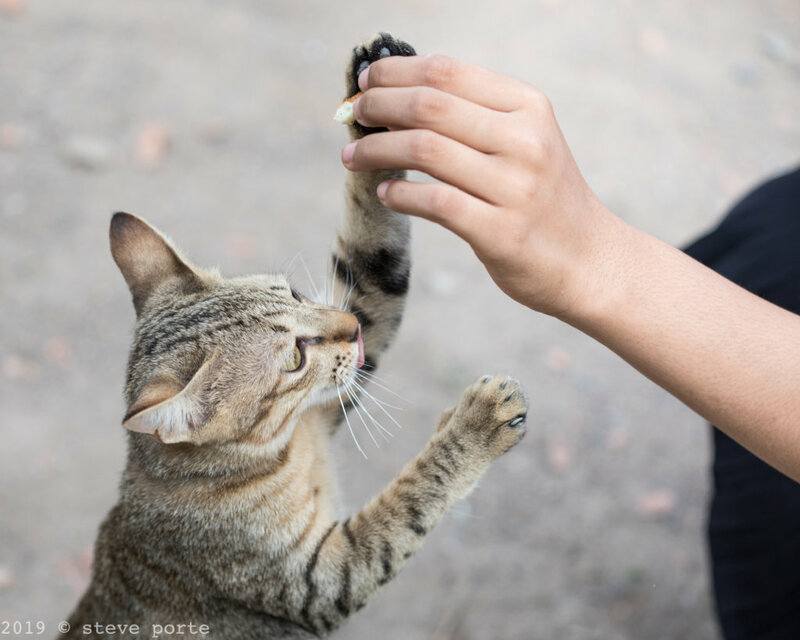 Thank you for reading this report and thank you all once again for your extraordinary help! Last week we had the great honour to welcome to our school the legendary dance teacher Madam Loak Yeay Em Theay. Considered a "Living National Treasure" in Cambodia, Madam Em Theay came with her daughter Madam Kim An our dance teacher to give a very special masterclass. In the earlier part of the twentieth century, Cambodian traditional culture flourished and was famous worldwide for it's grace and beauty. Passed down from master to pupil using the oral tradition, for over a thousand years it was given to each new generation. The traditional culture of Cambodia, most especially music and dance is considered sacred. The crowns of traditional dancers have wing like shapes at the sides to represent celestial beings. No music, dance or theatre piece can be performed without first paying homage to Buddha and the ancestors of the arts. No crown may be placed on a dancer's head without prayer and offerings made first. 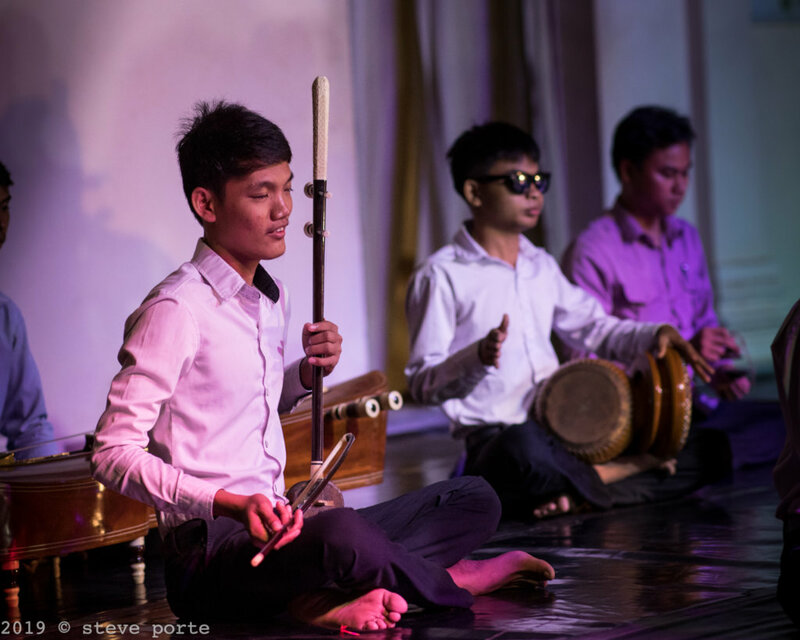 It is said that Cambodians experience music from the cradle to the grave and that they are a nation of artists. Alas the traditional arts nearly vanished when during the Khmer Rouge genocide between 1975-1979, approximately ninety percent of Cambodian artists were killed or perished from disease or starvation. Today rampant Westernisation of Cambodia and lack of attention and funding by the government also threatens this ancient cultural heritage. 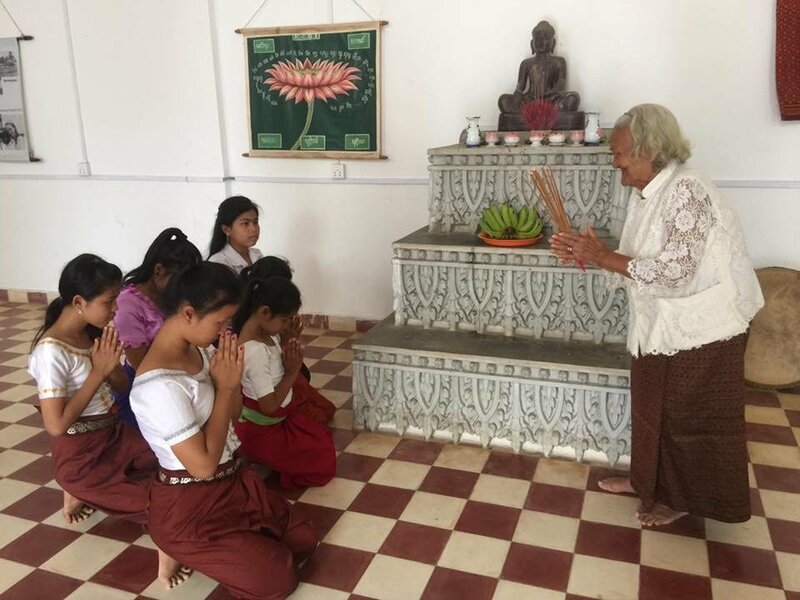 The Khmer Rouge genocide was preceded by war from 1970 and then followed by more civil war with the Khmer Rouge fighting from their mountain strongholds until the official ceasfire around 1998/99. Imagine therefore what effect this had on the very fabric of Cambodian society and the sense of identity as a people. It is for this reason that Madam Em Theay the last surviving dance master is so important. She is a living memory. In 1979 there were five great dance masters left alive, now she is the only one left. Madam Em Theay and Madam Kim An are from the Royal Ballet and before the war lived and danced in the Royal Palace and were taught by her Majesty Queen Kossimak. The Royal family of Cambodia were traditionally the guardians of the arts. When the terrible years of the Khmer Rouge rule ended, survivors slowly made their way back to the capital Phnom Penh. One of the first areas to be restored was the National Ballet and University of Fine Arts. Without any salary, because there was no currency (the Khmer Rouge had destroyed all banks and money), Cambodian artists were paid in rice and painstakingly pieced together their art forms, drawing from their memories. 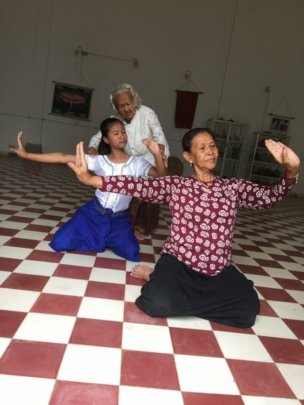 Both Madam Em Theay and Madam Kim An have devoted their lives to restoring their heritage, teaching children each dance step and hand movement. In Cambodian dance each hand movement, has a special meaning such as an unfurling leaf, a flower in bud, love and so on. Women and girls perform three roles, the maiden, the prince and the ogre. Men and boys perform the Hanuman Money King and his army. For each role the hand and body movements are different. It is incredibly sophisticated. In the first photograph you will see Madam Em Theay in the background correcting one of our students as she dances the male role of the prince, Madam Kim An is in the foreground giving the correct example. Girls who are taller and have longer faces are selected to dance the male (Nirung) roles, whilst girls who are shorter and have rounder faces dance the female (Neang) role. Madam Kim An teaches all our resident children and the children on our Outreach Program (which you all kindly support). This means many children from outside our school who come from impoverished and disadvantaged backgrounds can benefit from the highest quality training and learn about and cherish their cultural heritage. Despite her advanced age Madam Em Theay very kindly gave a free three-day masterclass to our resident children. We treasure her gift. 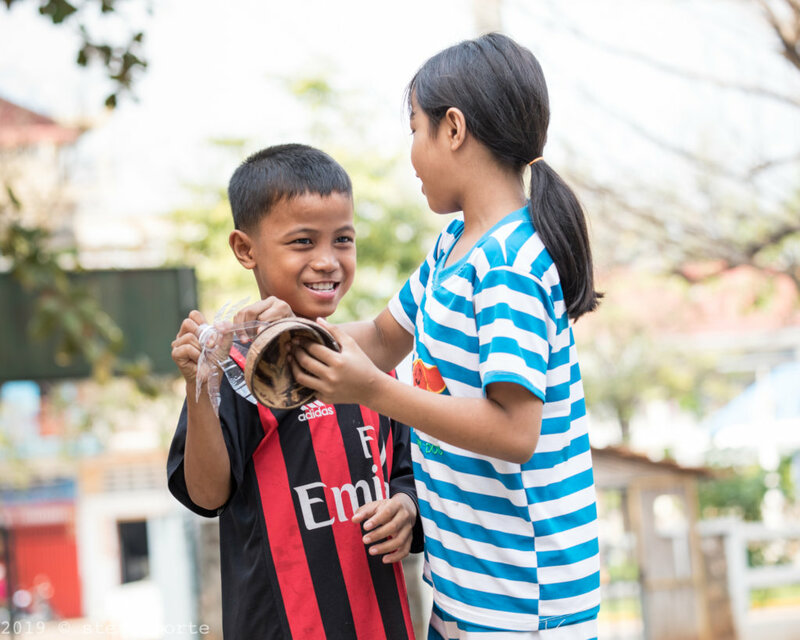 We would all like to thank you for so generously helping make our training programs in traditional Cambodian Music, Dance, Yike theatre and Shadow Puppet Theatre possible. We thank you for the kind support you give enabling us to reach out to many children. We thank you for your understanding that culture and the arts is a heritage which is so precious and really can make a difference in our world, bringing sublime beauty, harmony and solace to so many. Let us keep the arts alive everywhere! If you would like to invite your friends and family to participate in our End of Year Campaign on GlobalGiving for 2018, this campaign is now open and running and will end on December 31st at 23:59:59 Washington DC time.